What is a Labor Management System? 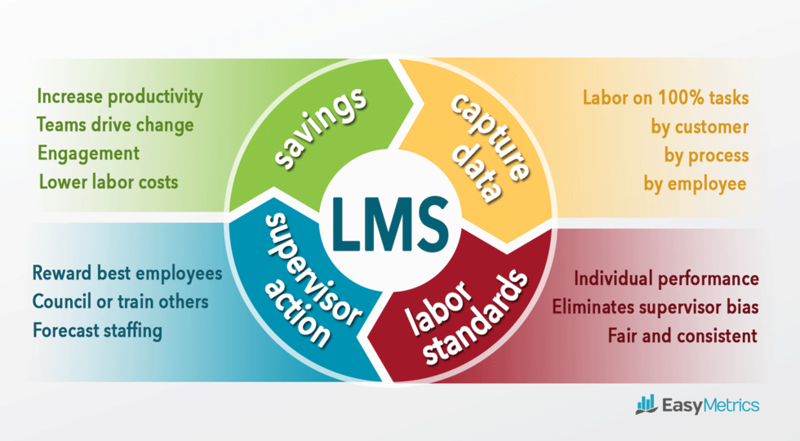 An LMS is software that takes employee activity data and reports productivity levels on a group of employees, or individual employees. Having an LMS helps organizations optimize workforce productivity by gaining visibility where their workforce labor dollars are being spent and how to optimize their labor. The LMS constantly captures and integrates data from multiple sources: Warehouse Management Systems, time clocks, RF scan, MRP, ERP, CRM and more. 1. Which employees to promote or reward, and which might need training or counseling. 2. Which processes need improvement because they are inefficient or many employees are struggling with it. Most LMS providers don’t clearly publish the true cost. Often, LMS’s are rolled into the cost of their WMS, but then they hit up the facility with consulting, and ongoing industrial engineering to update standards with human engineers – because rigidly coupled, inflexible LMS’s require it. However, a ballpark is: Traditional enterprise LMS’s cost between $250K – $1M per facility, between software licensing, industrial engineering and implementations plus ongoing licensing and support fees. Easy Metrics is cloud based, not traditional, with a greatly streamlined implementation process. Easy Metrics LMS is a fraction of the cost of traditional systems but delivers similar results. The typical facility leveraging Easy Metrics needs to save less than 1% of their total labor costs to breakeven and achieves a positive ROI within 5 to 8 months. The Easy Metrics LMS takes ~1 month to implement, in fact once we receive client data, we can have it mapped into our system in two weeks. There are times when more customization is required and as this customization increases the timeline for implementation can change but our customers realize value quickly in any scenario. PFP program will typically double the productivity gain that would be achieved over LMS tracking alone. Gainsharing, or pay for performance, rewards the employee with a bonus as they increase their productivity. It is important to understand your cost accounting by process for labor so the bonuses you pay out to employees come from measurable savings in the process. As an example, if the labor cost per unit is $1 and through productivity improvements the cost drops to $0.80, the employee could receive $0.05 per unit as a bonus. As a general rule of thumb, with LMS alone, expect 10-20% gains in productivity. When pay for performance is applied, improvements are 25-50%.